Top these deep-fried potato skins with sour cream, shredded cheese, and/or chopped cooked bacon. 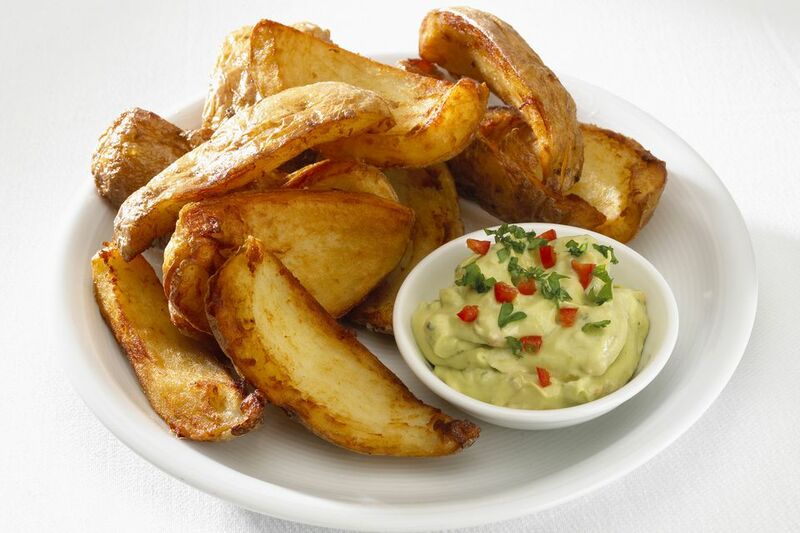 Or serve them with homemade guacamole, salsa, or a spicy dip. See the variations below for a few quick and easy homemade dips and some great ideas for toppings. Prick potatoes in several places with a fork; bake in a 400 F oven until tender, about 1 hour. Remove the potatoes from the oven, cool slightly, and then cut them into halves lengthwise. Scoop out the potato, leaving the skins intact. Put the potatoes in a container, cover, and refrigerate for another meal. Cut the skins in half again to make four pieces per potato. Heat oil in a deep fryer to 375 F. Place a batch of about 4 to 6 potato skins in the deep fryer basket, lower into oil, and deep fry for about 2 to 3 minutes, or until skins are browned and crisp. Repeat with the remaining potato skins. Transfer potato skins to paper towels to drain. Sprinkle with salt and pepper. Serve with sour cream and chives, if desired, or top with cheese, and place under the broiler to melt. Topping Ideas - Crumbled cooked bacon, minced sauteed ham, sliced green onions, sauteed fresh sliced mushrooms, sliced ripe olives, chopped red or sweet onions, minced jalapeno peppers, and multicolored bell peppers. Quick Guacamole - Peel 2 ripe avocados, and mash them in a small bowl. Add 1/4 cup of finely chopped onion, 2 tablespoons of lime juice, 1/2 teaspoon of garlic powder, and salt and freshly ground black pepper, to taste. Blend ingredients thoroughly. Stir in 1 tablespoon of chopped fresh cilantro, if desired. Sour Cream and Bacon Dip - Cook 6 to 8 strips of bacon and crumble. In a serving bowl, combine the crumbled bacon with 16 ounces of sour cream, 1 cup of shredded sharp cheddar cheese, 1/2 cup thinly sliced green onions, 1 teaspoon of garlic powder, and salt, to taste. Blend thoroughly. Ranch-Style Dip - Combine 1 envelope (1 ounce) of Ranch dressing mix with 8 ounces of sour cream, 1/2 teaspoon of chili powder, 1/2 teaspoon of garlic powder, and about 1/4 teaspoon of cayenne pepper or chipotle pepper powder. Mix well and season with salt and pepper, to taste.